The tag said 'Phalaenopsis Gigantia "Sunshine,"' but there is no "Phalaenopsis Gigantia" in the IOR records. 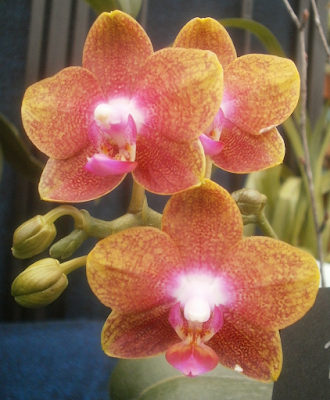 There is a species, Phalaenopsis gigantea, which as its name implies is enormous (leaves to 2 feet (0.6 m) long! ), with blooms that have dull red or maroon dots sprinkled liberally over a white, cream, or light pink background.1 It sounds pretty incredible, and photos that include the leaves are pretty impressive, both in the size of the leaves and the number of individual flowers per spike. However, basically none of that description applies to this plant. From the photo, I'm guessing it was in a 4 or 5-inch pot, which would make the leaves maybe 5 or 6 inches long. 2-foot leaves may not be required for blooming, of course, but if the leaves don't look like Phal. gigantea, and the blooms don't look like Phal. gigantea, I'm forced to conclude that either this isn't Phal. gigantea, Phal. gigantea is a lot more variable than Google lets on, or Phal. Gigantia is an actual plant that the International Orchid Registry has somehow just not heard of yet. 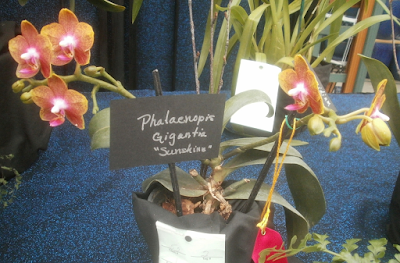 And I trust Google and the IOR a lot more than I trust orchid show tags.